India is the land of contrast. I'd heard after visiting India your perception of the world will change. And that's true. Depresing poverty, pollution and chaos mixed with the unimaginable wealth and architectural wonders. The sight of cows grazing in front of luxurious shopping malls is completely normal. The piles of rubbish, manure and waste covered with a blanket of flies right besides street food stands and restaurants are also pretty common. India is not for everyone, when you plan the trip, prepare yourself for a huge cultural shock and disturbing and highly uncomfortable scenes you will come across. However, after a while, when you get accustomed to what India's like, it can be the best trip of your life. If you plan to visit India just in order to spend your time in a nice hotel or on the beach, don't waste your time and money. Embrace India for what it's really like. In India, we went to many places, we've seen the famous New Delhi, Hyderabad and Taj Mahal as well as the unknown, remote areas where few tourists venture: Visakhapatnam, Araku Valley and the paradise, unspoiled by modern consumerism - Lakshadweep Islands. It's impossible to visit India without an adventure. We had some extremely crazy ones, when the bus broke down in the middle of the jungle or when we got stuck with local fishermen for 8 hours in the middle of the ocean. Expect no rules, lots of noise, delays, cancellations, expect the unexpected, and you'll enjoy it! Araku Valley - located around 100 kilometers (62 miles) northeast of Vizag (Visakhapatnam) is not one of the most visited tourist destinations in India. Here, you can really experience the local life among the beautiful rolling hills of the valley. It's like being teleported to a different world and time. The rich soils abound with coffee and black pepper plantations and the area can boast some magnificent waterfalls, caves, cliffs and forests. Also, don't forget that you are in India and the mentality is quite different, more relaxed, not everything works properly and according to a timetable and as a result of that you are about to enter the land of great adventure and if you keep on reading, you will see for yourself why. 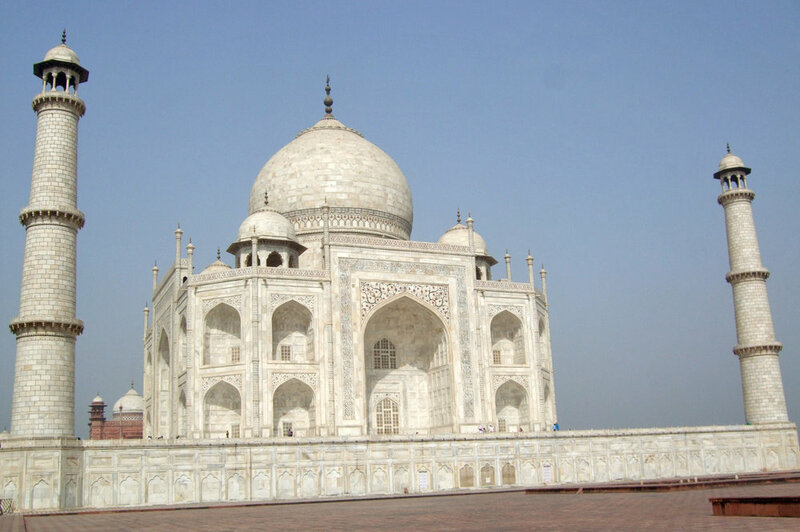 Taj Mahal is the most famous attraction of India, it goes without saying. I just couldn't miss it during my hectic stay in this country. After visiting the tropical south: Visakhapatnam, Kerala and the paradise Lakshadweep Islands, I arrived in New Delhi. Now I had to get to Agra, where the famous Taj Mahal is located, so quite a long ride in a pre-booked taxi was awaiting me. I traveled with an Indian family throughout this vast country and it was a really good chance to meet the culture, customs and habits from the inside. The taxi was a mini van, really comfortable and air conditioned (which helped to endure the heat). New Delhi, the capital of India and the city of Hyderabad were last two places I visited in India. After traveling through south and east as well as Lakshadweep Islands, those cities seemed a bit more organized and less polluted (according to Indian standards) to me than the rest of the country. The climate is different than in the south, drier and a bit cooler in winter, there's no lush green patches of coconut forests covering the hills but bare dessert like plateaus (especially in Hyderabad). I spent two days in New Delhi, then I took a domestic flight to Hyderabad where I stayed one day and from there I flew back home. Crystal clear blue waters, coral reef full of colorful fish, white sand beaches, coconut trees leaning towards the sea, a perfect recipe for paradise. This is what Lakshadweep Islands are like. Formerly known as Laccadive Islands, they are situated around 400 kilometers (250 miles) from the west coast of India in the Laccadive Sea (above the well known hot tourist spot - Maldives). The archipelago consists of twelve atolls with around forty islands and islets, ten of which are inhabited. The name "Lakshadweep" means one hundred thousand islands in Sanskrit. The islands are governed by India. The beautiful park located on the hill near the city was the first place I visited in Visakhapatnam. The traffic was absolutely mad and I still couldn't believe my eyes that all this was real. But the park and the view from the hill were stunning. It was cleaner there than in the rest of the city, but still, to see a lot of rubbish thrown everywhere in such a beautiful place was an eyesore. The interesting thing is that my friends and I didn't encounter any western tourists there with the exception of two white people during our 3-day stay in Vishakapatnam. Therefore we noticed huge interest and curiosity of the locals. They kept looking at us all the time and quite often someone (especially children) asked where we were from and they wanted to know something about our life and culture. A couple of months after I received my visa, everything was booked and prepared I was ready to set up on a trip to India. After 2 flights that took about 10 hours I and my friends finally landed in Hyderabad. From there, we were going to take another (domestic) flight to Visakhapatnam - our first destination. When the door of the aircraft opened, I reminded myself about all the stories I had read on the Internet and was wondering what my first impression would be. And... to be honest, nothing exceptional, no big crowds, no thousands of people, no smell, just heat. It was very hot indeed. Before I came up with the idea of traveling to India, I'd had a chance to meet a few Indian people. It turned out that they are a very friendly nation. I quickly made a couple of friends and one of them invited me to visit him and his family in India. I couldn't say no, I was very excited because it was going to be my first journey to such a far away and different culturally land. I didn't know what to expect at all. I tried to prepare myself for what I might see there but it was hard to imagine how India could look like. I browsed through many websites and forums looking for information and experiences of people who had visited this vast country. Some of the articles scared me, saying that once you get off the plane your jaw is going to drop immediately because of what you see around. There were supposed to be crowds of people, bad smells everywhere and beggars that didn't want to move away from you no matter what. Other posts, however, filled me with even more excitement, I just couldn't wait to see for myself whether the reality is the way I'd read on the Internet.